The beach-dune ecosystem is one of the most sensitive and declining habitat types on the West Coast. It’s home to numerous species of plants and animals, each occupying a precise niche. Human threats to the beach-dune ecosystem include sedimentation, chemical runoff, litter and pollution, disturbance and habitat loss. Though on the margins of a world-class metropolis, San Francisco’s coastal areas still retain functioning ecosystems with plants and animals that struggle to survive the many urban pressures. 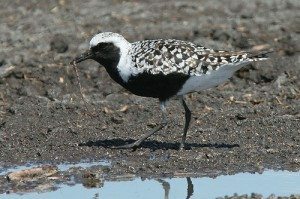 Some species like the Snowy Plover, Brown Pelican, and San Francisco Lessingia are on the federal Endangered Species List. Others such as the Long-billed Curlew, Whimbrel, Sanderling, Heermann’s Gull and Elegant Tern are also vulnerable and are species of concern. Beachgoers can unknowingly harm this sensitive ecosystem by disturbing wildlife, contributing to erosion and fostering predators. Through public education, awareness, and good stewardship practices, we can achieve a balance that will accommodate people as well as wildlife. Snowy Plovers have occupied this coastal shoreline for thousands of years, along with a variety of other bird species that use this habitat for resting and refueling. Shorebirds that breed in the high Arctic such as Black-bellied Plover, Whimbrel, and Sanderling arrive here for wintering grounds, joined by species such as Willet, Long-billed Curlew, and Marbled Godwit that breed in the North American interior. In the summer, flocks of Heermann’s Gulls and Elegant Terns (both species of concern) leave their breeding grounds in Mexico and come north to rest and feed on San Francisco’s beaches and nearshore waters. …and a variety of dune plants. 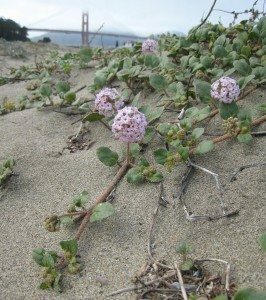 Unique communities of low-growing plant species inhabit the dune ecosystems of the Pacific Coast. These plant communities play an important role in shaping and maintaining dune structure as well as providing for an expanded web of biodiversity. Some examples include Pink sand-verbena, Yellow sand-verbena, Beach saltbush and Beach evening primrose. *Quotes from U.S. Fish & Wildlife Service, Snowy Plover Recovery Plan.